Next time the power goes out, be ready thanks to this Amazon deal! 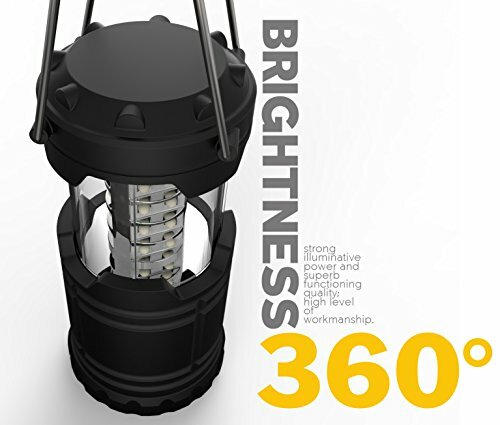 Hurry and get the Portable LED Camping Lantern, Lemontec water resistant Ultra Bright 30 LED Lantern for Hiking, Emergencies, Hurricanes, Outages, Storms, Camping (3 AA Batteries), 3 Pack today for only $13.99 from Amazon! That’s only $3.67 per lantern! Plus, nearly 800 great customer reviews. Check out all of the Amazon deals here! Handmade from military grade, water-resistant plastic; very durable and multipurpose; can be used in all spaces indoors or outdoors; built-in safety features; childproof. Our lantern is hand-built from heavy duty, water-resistant, and very durable military grade plastic. The rugged body and versatile design enables its use in all conditions, indoors or outdoors. Wherever you use it and for whatever need, you’ll be amazed by the amount of omnidirectional light it emits. It is easy to carry due to an ingeniously designed frame that collapses with a single touch. The lantern folds and unfolds easily, without compromising on sturdiness. With its fold-out and collapsible handles the lantern can be put on a table or hung from a branch. Its compact and lightweight body makes it an indispensable tool during road trips and camping, and for any emergency. With a low-powered 30-LED array and 3 long-lasting, rechargeable AAA batteries (NOT included), the lantern combines optimal brightness with frugal energy use. You get 8 hours of maximum lighting, and 4 additional hours of dimmed lighting. Brighten any space in any environment and under any conditions with our superbly designed, well made, and safely operable lantern. We guarantee its quality and durability, for as long as 10 years! Buy the Portable LED Camping Lantern, Lemontec water resistant Ultra Bright 30 LED Lantern for Hiking, Emergencies, Hurricanes, Outages, Storms, Camping (3 AA Batteries), 3 Pack from Amazon.